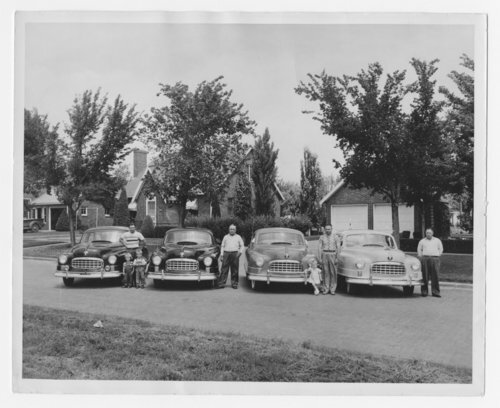 This is a photograph of the Michaelis family with their Nash cars in Russell, Kansas. The father Honis and his three sons each owned a Custom Ambassador Airflyte. The photograph was taken when Boyer Nash Motors, Inc., Salina, Kansas, delivered the last car to the Michaelis family. People in the photograph are (left to right) Marvin Michaelis, his children Beverly and Danny; Honis Michaelis; Herbert Michaelis, his daughter Linda; and Leroy (Roy) Michaelis. This photograph was published in the Nash News, Volume 13, Number 8, September 1949, along with an article on testing full-size cars in a wind tunnel at the Municipal University of Wichita at Wichita, Kansas. The photograph was taken on 4th Street near Maple Street. Honis Michaelis had the brick houses in the background built for himself and two of his sons. Honis lived in the house on the right (408 Maple) and Marvin lived in the middle house. Roy lived in the house on the left for a time.